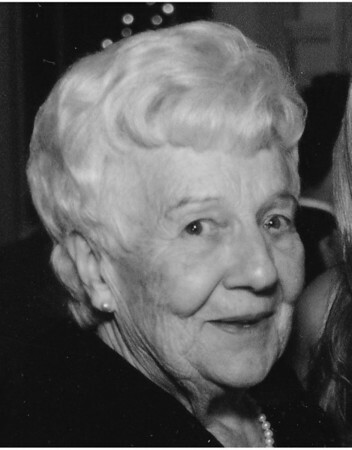 Laia Francini, 95, devoted wife, mother, and grandmother passed away on Jan. 27, 2019, at her home, in the company of her loving family. Mom was born on Aug. 4, 1923, in New Britain, the daughter of Alfred and Rose Balducci. On Jan. 10, 1944, she married the love of her life, Leo Francini. She and dad were married for 75 years. His loss three weeks ago, at the age of 99, was a sad moment for our entire family and especially devastating to mom’s will to live without him in her life. They made their home in New Britain, where they raised their family. She cherished family gatherings, loved to cook delicious, homemade Italian dishes, and kept an impeccable home always open to company. In her younger days, mom was an active member of both St. Ann’s and St. Francis churches. Her generosity of time and support to both family and others was never flaunted; rather, it was offered in a spirit of helpfulness to those she loved. She will be missed by her entire family. She leaves two sons, Robert Francini and his wife Diane; Mark Francini and his wife Pamela; and a daughter, Donna Miles and her husband Robert. Mom had the good fortune to celebrate the arrival of six grandchildren: Sara Francini and her husband Alistair Paxton, Ryan Francini and his wife Amy, Joshua Miles and his wife Sarah, Brandon Miles and his wife Brittney, Justin Francini and his wife Danielle, and Amanda Quatrocelli and her husband Daniel. In the last five years, seven great-grandchildren were added: Olivia, Leo, Ada, Emma, Parker, Asa and Sloane. She loved spending time with them, and in her later years, she cherished their visits to her and dad’s home. She was predeceased by her brother, Leno Balducci and his wife Angie, Joseph Balducci and his wife Emily, and her beloved sister, Aldria and her husband Nino. She leaves many loving nieces and nephews. A special thanks to her caregivers, especially Janet Gordon. Friends and family may call at Carlson Funeral Home, 45 Franklin Square, New Britain, from 9-10:30 a.m., Wednesday, Jan. 30, followed by a Mass of Christian Burial at 11 a.m. at St. John Evangelist Church, 655 East St., New Britain. Burial will follow in St. Mary Cemetery. In lieu of flowers, memorial donations may be made to the Aquatic Department at the Hospital for Special Care, 2150 Corbin Ave., New Britain, CT 06053. Please share a memory or note of sympathy at www.carlsonfuneralhome.com . Posted in New Britain Herald, on Sunday, 27 January 2019 20:53. Updated: Sunday, 27 January 2019 20:55.